Steve Wynn, speaking to Chris Wallace on Fox News Sunday this morning, said that he had checked with all his staff (right down to masseurs and beauty shop operators) who had or might have had contact with Paddock or Mari Danley, and they reported that no one had ever seen Paddock or Marilou take a drink. Of course, this is unusual, because alcohol is not only free, but encouraged for gamblers at Paddock’s level. Since 2006, Paddock nor his girlfriend ever had a drink. Trips to the Middle East. No alcohol. Rational and quiet and moderate. This is the opposite of the profile the clowns at the FBI have described. It’s a tell. Another clue. The gunman who opened fire on a country music show in Las Vegas killing 58 people before turning the gun on himself appeared to be “a rational man” with “a vanilla profile,” according to a casino boss who knew him. 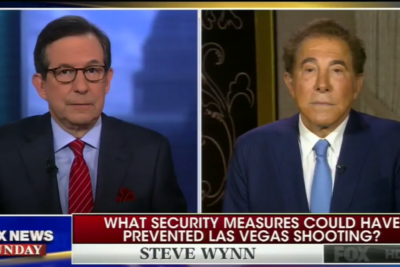 Speaking in an exclusive interview with Fox News Sunday, the billionaire owner of Wynn Resorts, Steve Wynn, who is also the RNC finance chair, said shooter Stephen Paddock had been visiting the city for 11 years and was known to staff as a regular guest, although he was not staying at a Wynn hotel when the attack took place. “He’s been staying in Las Vegas since ‘06. So you know, we’re talking about 11 years with his girlfriend or at least in recent years, frequent visitor, once or twice a month, to this hotel and others,” Wynn told Fox News host Chris Wallace. “A modest gambler, at least by our standards, you know, nothing serious, paid promptly, never owed any money anywhere in Las Vegas. He didn’t fit the profile of a problem or compulsive gambler,” he added. The hotel magnate said Paddock’s previous behavior belonged to “a rational man,” suggesting his employees were shocked to discover Paddock was responsible for what has become the deadliest mass shooting in recent U.S. history. “This is a man who behaved rationally, privately, a little introverted, liked to play video poker. But he was a rational man. And every historical review of his behavior indicates that he was a rational man; so was his girlfriend. And yet he prepared over an extended period of time, a totally irrational act,” Wynn said. “Now, this sounds like someone either totally demented, a behavior which he never evidenced, or someone who’s sending a message. This is a plan. We don’t know what that message is or if there is one, but this behavior, according to my employees, is as stunning, as unexpected as anybody, any of them have ever met. And that’s the status, you know, that I hear from the sheriff, and watching television that seems to be the moment — the momentary analysis of this situation. I really don’t have anything to add to that,” he said.